Welcome to the pages of the Embodied Generative Music (EGM) research project. 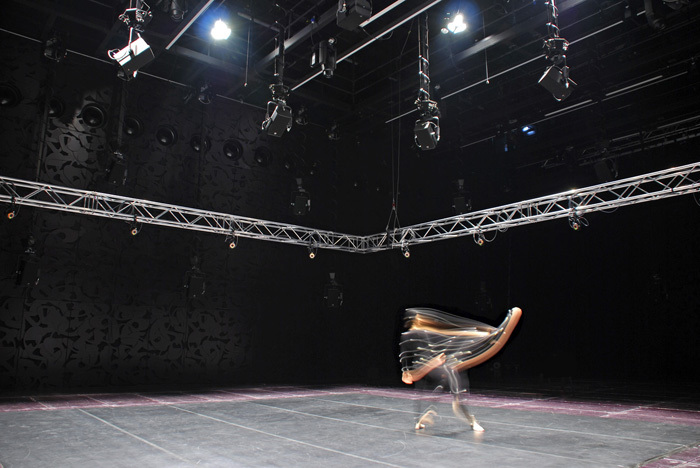 The project, funded from September 2007 until April 2010 by the Austrian Science Fund (FWF) and hosted at the Institute of Electronic Music and Acoustics (IEM), carried out basic research into (1) new means of artistic expression and (2) musical experience. It combined practical (artistic) and theoretical (philosophical and musicological) research strands, centered around applied phenomenological work and artistic research in a designated aesthetic lab. Starting with a project overview, the present pages are dedicated to presenting the endeavours and concepts that drove the project team, and insights reached, via de- and reconstructing the relation between musical expression and bodily expression in an interactive performance environment for embodied generative music, in aesthetic lab work with dancers and choreographers, and in conceptual explorations in philosophical aesthetics regarding key issues of the dancers’ experience in particular and musical experience in general. See also project highlights.